There was a time that getting a 4K UHD player would cost you an arm and a leg, even more so if it was Dolby Vision capable. But with technology advancing at crazy pace what was considered affordable by only a handful of people is now becoming mainstream as not only technology becomes cheaper but there is the constant pressure that streaming is putting on physical media devices. Today we will be reviewing a 4K UHD player from Philips with the company having their second 4K player in the market now making them no strangers to the new format. And while most know them from their excellent quality TVs they are making 4K UHD decks for a while with the BDP7501 being their first, HDR10 only, player that was considered a good alternative to all Panasonic, Samsung and LG had to offer. Today we will be reviewing their second UHD player and it manages to raise a few eyebrows as we are talking about a player that has Dolby Vision support and comes with a sub-$200 price that, all things considered, sounds amazing. But is the price alone enough to make this player a good option against the other big players in the market. 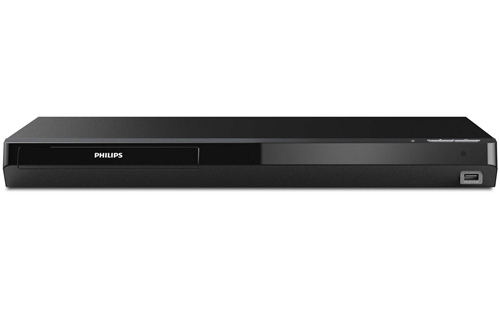 Continue reading our Philips BDP7502 review to find out. Having such an extremely low price means that there are many corners that need to be cut and Philips had to consider what should be a priority in such a player. Performance over looks is usually the way to go in such kind of situations and as such the player does look extremely cheap at first glance. There is nothing on the outside that would reveal it’s true capabilities and most people that would see it would probably mistake it for a DVD or a Blu-ray player at best. And while the previous player from Philips, the BDP7501, had a very small, squarish design here we get a more usual rectangular shape that we are accustomed seeing. The player has a size of 17.0 x 1.9 x 8.2 inch (430 x 46 x 208 mm) and weights 3.75 lb (1.7 kg) which makes it rather lightweight and easy to carry around. The front face is made out of plastic and it has a rather strange angular design. To the left we get the disc tray while on the bottom right we find one USB port that you can use to connect external storage. To the left of the USB port we get the IR sensor but due to it’s position and because of the angular front it can be some times a bit hard to register. More than a few times we had to directly point the remote to the sensor otherwise it wouldn’t respond. Just above the USB port on the top side we get the only 2 buttons you will find for powering on the device and ejecting the disc tray. Both of them have a very cheap feeling and we had to apply a decent amount of pressure to register. Another characteristic is that the player has no front display. Nothing shows the function of the player and only a small light to the left of the buttons will reveal that the player is actually on. Now this is not actually bad for some people as we know more than a few that don’t like the light distraction of a front display but nevertheless we have to mention it as it’s omission is a direct result of it’s low price. Similarly the included remote is nothing special as it also feels kinda cheap and low cost. The layout of the buttons is rather good with a couple of dedicated buttons on the top, navigation buttons below them, playback buttons coming after and numerical buttons at the bottom. The remote has a very plastic feel to it but at least it did what it should without any problems. Naturally there is no backlight and at this price it would be crazy to expect any. The BDP7502 is a cheap player and it’s looks certainly reveal this. Naturally in this price there shouldn’t be any expectations at least as far as the design is concerned and it shows that Philips decided to spend most of the unit’s price in other, more important aspects of the player. If you are considering such a low priced player then we believe that looks will be the least of your concerns. The player may look cheap but Philips made sure to spend most of the budget where it matters the most and this is it’s video and audio capabilities. As such the BDP7502 has not only HDR10 but also Dolby Vision support making this deck the cheapest 4K UHD player that supports this more advanced HDR protocol from Dolby. There is no HDR10+ support and we haven’t heard if there will be any in the future with some firmware update but we are still a long way of to find content that supports this. For testing out the video capabilities of the player we chose to test the 4K UHD disc of Fantastic Beasts: The Crimes of Gridelwald. We have already reviewed the UHD version of this film and we knew that it has amazingly sharp picture and the BDP7502 manages to show this on the screen. 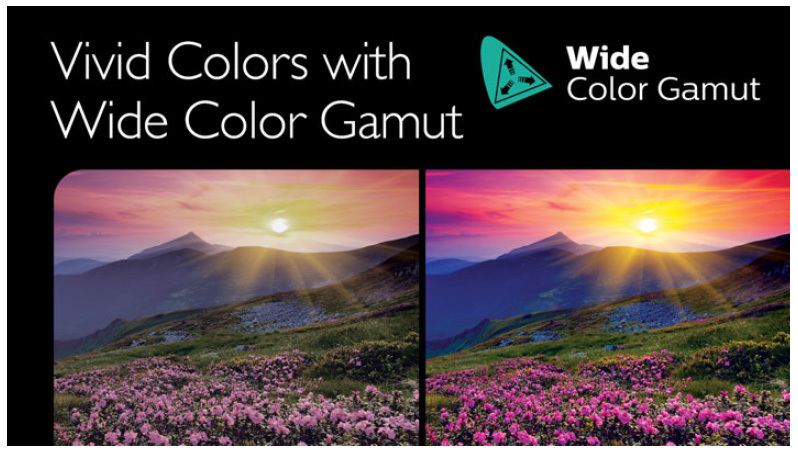 The extra resolution reveal every small skin imperfection and cloth texture details while wide color gamut and HDR create amazing and lifelike colors that really pop out and give you a sense of depth in an otherwise two dimensional image. The film comes with Dolby Vision and the player succeeded in showing it on screen without any trouble. For such a cheap player the BDP7502 has top quality image performance and it will be hard to believe that so good quality along with Dolby Vision comes out from such a cheap player. And while most looking at this player will be interested for it’s UHD capabilities we should mention that the player is also a very good upscaler. We tried a few Blu-ray discs to see how 1080p content would be scaled to 4K and we were very pleasantly surprised by the results we saw. The amount of detail was amazing with the Philips player making a very good job at that. SD content also upscaled very good and we saw this by trying a few old DVDs that we still had but of course source material plays a big role on how much of an improvement you will see with such low quality images. The player also supports High Resolution Audio as there is support for audio files like 192/24 FLAC & WAV that you can stream either from the USB port or through your local network. We tried both ways and all FLAC files we tried played flawlessly. Unfortunately there is no SACD or DVD-Audio support but we are not complaining. Closing this part we will say just this. The Philips BDP7502 provides top quality performance and that is it’s number one strong point. If performance is the only thing that matters to you then you will be hard to find a player that offers better quality at this price. The BDP7502 is an odd one as far as ports is concerned. And while design is one of the first things that was affected by the low cost, connectivity ports should naturally be the second one. In the front we already mentioned the USB port but turning the player at the back we get an rather unusual sight of dual HDMI ports. Having 2 HDMI connectors may not be so rare as we have seen many players having a dual HDMI setup but when we are talking about such an extremely low budget player seeing this seems a bit strange even if a welcome sight. Two HDMI ports means that you can use one to connect the player to the TV just for the image while the 2nd port can be connected to an audio device, like an AV receiver, just for the sound. The player also comes with an Ethernet port for wired connection to the Internet and the familiar digital optical output. Very basic connections with the exception of the 2nd HDMI port which is a welcome addition to such a cheap player. Most probably what is there is enough and we cannot ask for anything more. Home menu and settings are very simple and easy to follow. And although the player is pretty much plug an play we found out that you will have to make some original changes to the settings once connected as we had to change Audio to “bitstream” and Dolby Vision to “Auto” in order for everything to work correctly. And although for most people that know even basic calibration this is easy for some inexperienced we are sure would leave them at their default. The player supports online streaming even if it’s capabilities are rather limited. We get 2 streaming services with Youtube and Netflix being the only ones we can use. At least the Youtube app now supports not only 4K but also HDR which is a plus. Streaming was without problems but we were using a wired connection which is preferable when you want to stream in 4K resolution. If you need more streaming services then you will probably need to use a dedicated streamer but even having some services we consider a plus. The BDP7502 also supports USB playback but here things are a bit of a mixed bag. The player only supports FAT/FAT32 so if you have external storage in NTFS or ExFAT formats you are out of luck. Also although the player can play a wide range of formats and files there is no MKV support which is the most usual container for streaming video files through USB which is really a bummer. We cannot say we are thrilled with the player’s USB playback capabilities but the player was never meant to be used extensively for this. Other than the USB port the player supports streaming through your local network so if you have a dedicated NAS server you can use the player to stream your favorite music. We tried streaming both with a wired connection and with the built-in WiFi and both worked flawlessly. Additionally the player supports HDMI CEC functionality which means you can use the remote of your TV or the player to control both devices and thus lower the number of remotes you have to use in your setup. Loading times were pretty good as on average it took around 10-12 seconds to load the disc’s menu screen. And while loading times felt pretty fast noise was average. We cannot say that it was annoyingly loud but during quiet moments you could understand when the disc was spinning. One observation we made was that during DVD or even Blu-ray playback the disc tray was completely silent and only when it was reading 4K UHD discs we could hear it a bit. Nevertheless when even a little bit of sound was audible from the movie it was covering the spinning noise and that’s why it never bothered us. One thing that’s very important to mention is that the player works with 120V/60Hz AC so if your country supports a different, 220V-230V, electric network you will need to buy an adapter for it to work. It’s a small thing but it will add a bit to the cost and you should be careful before connecting it in order not to destroy the player. When we initially started this review we didn’t know what to expect from such a cheap UHD player. Certainly first impressions by looking at the unit will not win anyone as it looks remarkably cheap and low cost. But when you finally power up the unit and go through your first UHD viewing it’s when it will win you with it’s amazing video and audio performance. Naturally Dolby Vision support is the highlight here and the player does perform as good as some more expensive players. If you add the built-in Dolby Atmos and DTS:X support as well as the included, even if limited, streaming services the end product is stunning to be honest. On the downside the player looks cheap with it’s uninteresting design, has limited streaming capabilities by supporting only 2 of them and USB playback leaves a lot to be desired as it fails to support various storage formats and video files like MKV. In the end if all that you care about is UHD performance the Philips BDP7502 is an excellent choice as it is one of the cheapest, Dolby Vision enabled, players in the market today and with the kind of performance that it has it is hard to judge it harshly for all of it’s other omissions or downsides. Philips put performance above anything else when they created this player so if you are looking for a more all around player then you should look elsewhere, otherwise the BDP7502 is an excellent player worthy of consideration. Hi Stratos. Thank you for this great review on the BDP7502. I love the streaming features, even if they are limited, of the player and the 4k performance this has which makes it even more price worthy. I guess I just have to give out my old Blu-ray player and get this because at some point I wanted to go 4K but price was a no go for me. I can’t wait to get it. Thanks for sharing. There is no better time to go 4K than now. Prices have gone down considerably and all electronics that are 4K capable are relatively cheap so you can also enjoy the new 4K era without having to spend huge sums of money. The price was a limiting factor for UHD players but the prices have fallen so much now that there is no reason not to buy one anymore. A very informative and useful review on the Philips BDP7502 player. With reasonable price, having Dolby Vision is quite enough for me. I think for a person who wants an all-around perfect player with more features would definitely need to look for a better player than this one as you mention. Thank you so much for sharing this valuable and detailed review. You are welcome Ranao. For more reviews check our other articles also. Wow, this player is extremely cheap for having such features, personally i like the design so this is not a big one for me, I just hope its performance will be as good as you say because I’m going for it, I love things like the double HDMI ports and the fast loading times. If it covers your needs then go for it cause it’s image and audio performance is extremely good for it’s price.